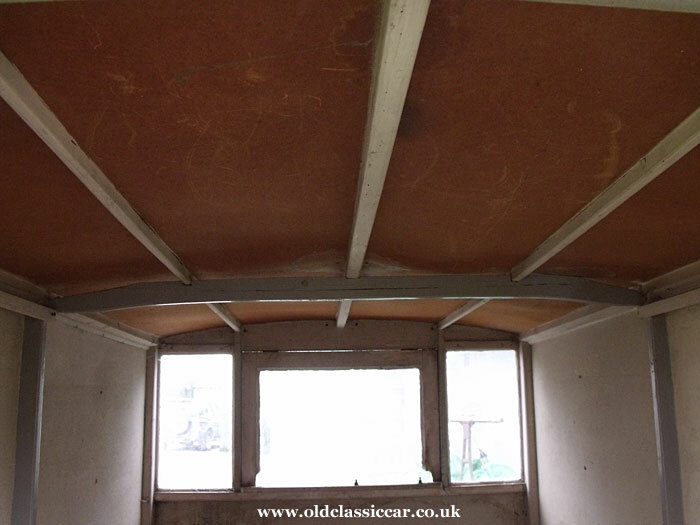 Old caravan needing restoration found. Homepage. 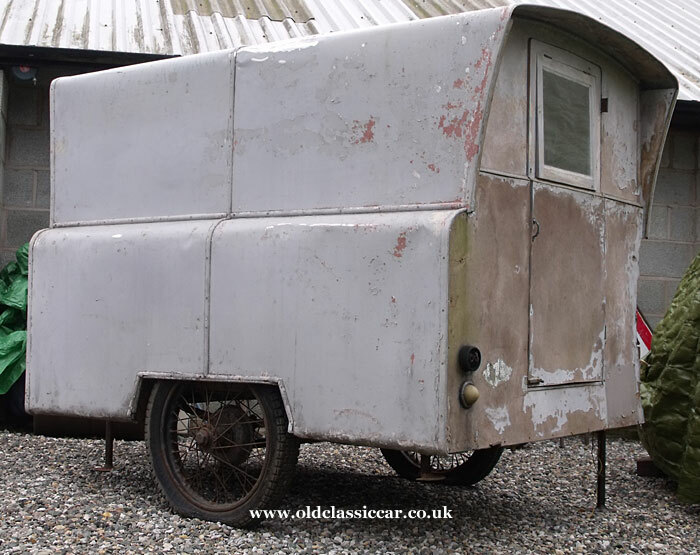 This page: Can anyone help me identify this unusual, and very small, caravan? Tiny one-berth caravan from the 1940s. My first "compact" caravan was a smart Portafold, a fibreglass-bodied job that was purchased from a stallholder at the Beaulieu autojumble in, I think, 1992. It did get used on a couple of occasions, during car show weekends, and was sold on after a period of idleness (the caravan's, not mine...). This was followed a good many years later by a folding two-berth Wessex caravan, which dates to the late 1940s. This was in 2006. I hung on to it for a while before another, large-scale, restoration project meant that all available funds would be heading in that direction, and not to the caravan. So, reluctantly, it was sold to someone who owns a pre-war Standard car with which he planned to tow it to shows etc. I didn't really expect to buy another old caravan anytime soon, although it had crossed my mind on occasion since the Wessex' departure. An advert for a weird-looking and very small one-man caravan popped into view one evening, while perusing the internet. 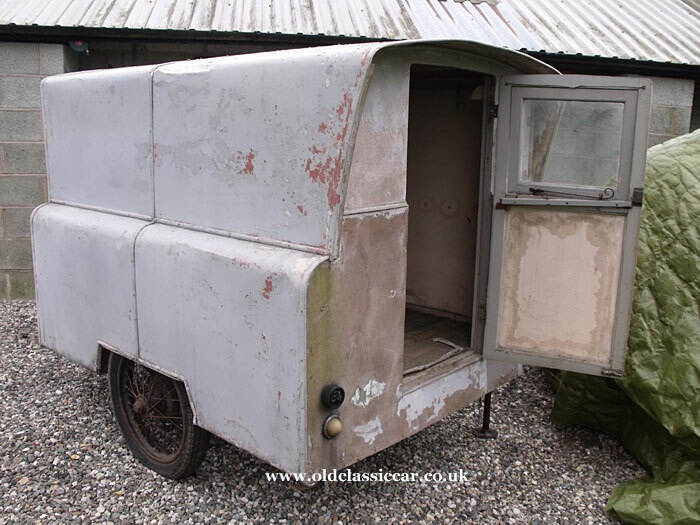 The seller had no information as to who built this distinctive creation, in parts it looks like a professional job, but equally it could be a home-built one-off. Clearly, whatever its origins, it was designed to be towed behind a small car. 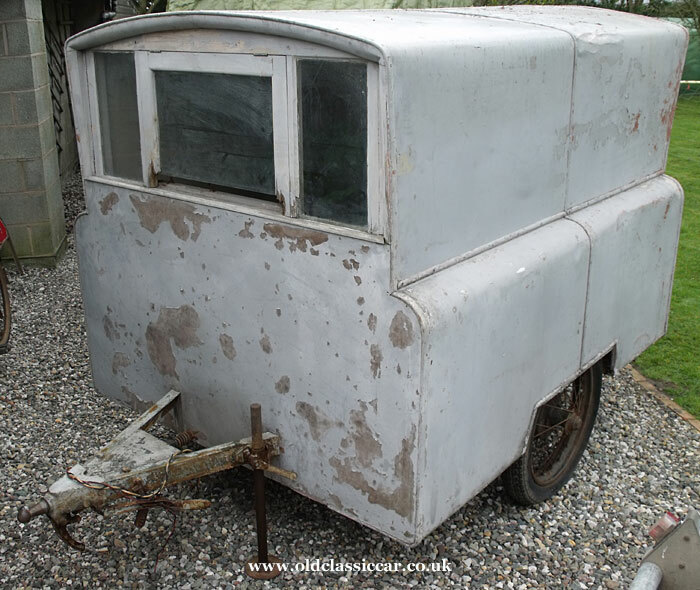 In the 1930s there were even caravans designed for towing behind a motorcycle, but I doubt that this example was so designed. Despite damage to one side, no interior fittings to speak of, plus one or two dark looks from the other end of the sofa, a deal was done. Thoughts then turned to how it might be collected. It has an unusual type of tow-hitch, where the ball is mounted on the caravan instead of the car. This was a feature on a number of caravans built from the 1930s and into the 1950s. 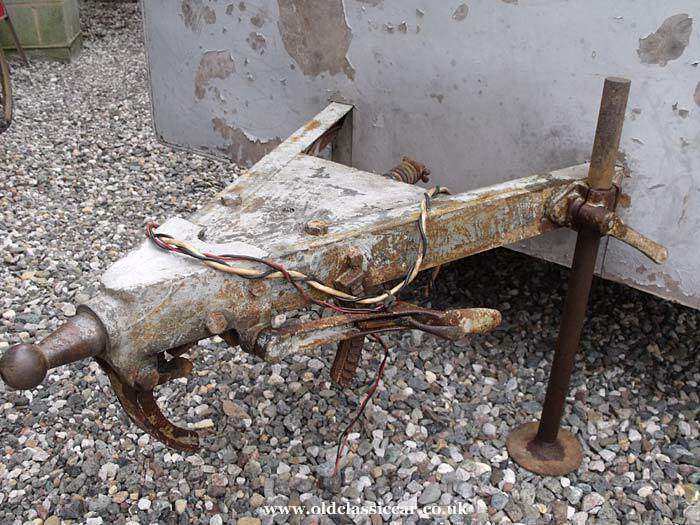 The seller didn't have a matching hitch for the car, and the tyres were clearly shot anyway, so a car trailer on which to retrieve it was arranged. Loading it onto the trailer was no problem, thanks to the caravan's amazingly light weight, and its compact dimensions. The body measures 6ft in length, or 8ft if you include the A frame at the front. 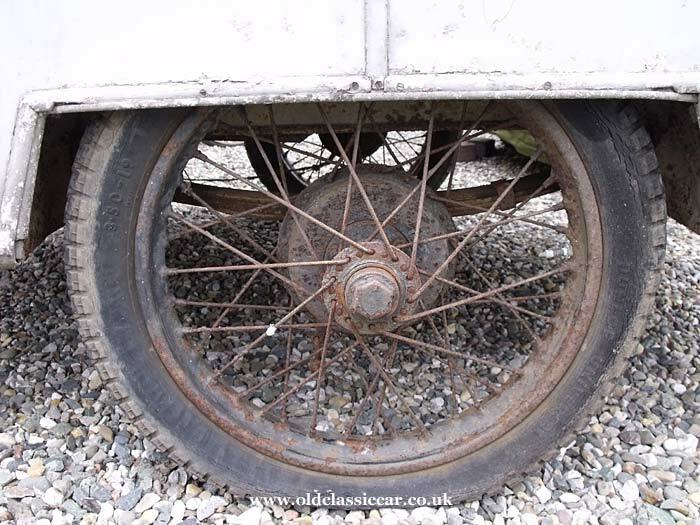 The wheels, which from a distance look like Austin 7 items, are 19" in diameter, and of a type typically sold to anyone planning on building a trailer, or as here a small caravan, either side of WW2. The design in greater detail. Despite being at the austere end of the caravanning spectrum, there are a few neat details. For a start, it incorporates a simple braking system. I particularly like the handbrake mechanism, and the aforementioned hitch. The wheels are fitted with crumbling 3.50 x 19 Dunlop Universal crossply tyres, while three drop-down steadies also feature, two at the rear - beneath the body - and one at the front. Talking of the body, a few details of its construction. The sides and roof are formed from aluminium. The material was in good supply in the years following WW2, which makes me wonder if the caravan dates to that era, say the late 1940s. The front and rear panels are both cut from what appears to be a type of fibreboard. The centre window at the front is hinged at the top, fitted into a wooden surround. The rear door also incorporates an opening window within it. 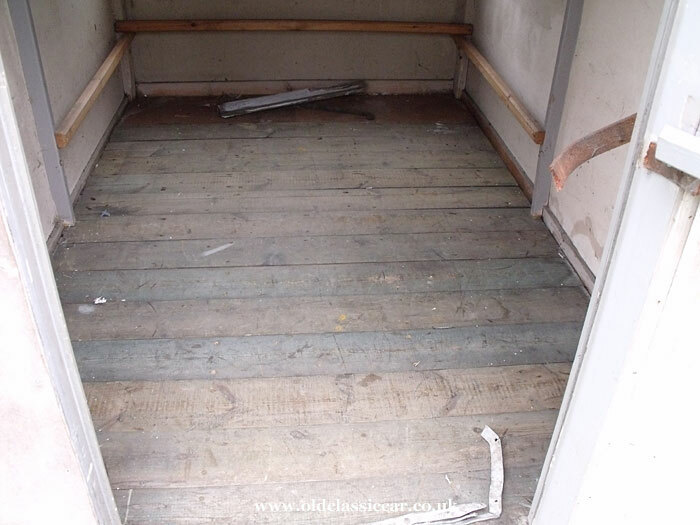 Inside, the flooring is wooden. Despite the exterior aluminium being damaged, quite badly on the offside, structurally this odd survivor is in pretty good order. The remains of two rear lights are still in place. The method of connecting the lights is interesting. No standard plug-in socket is used here. 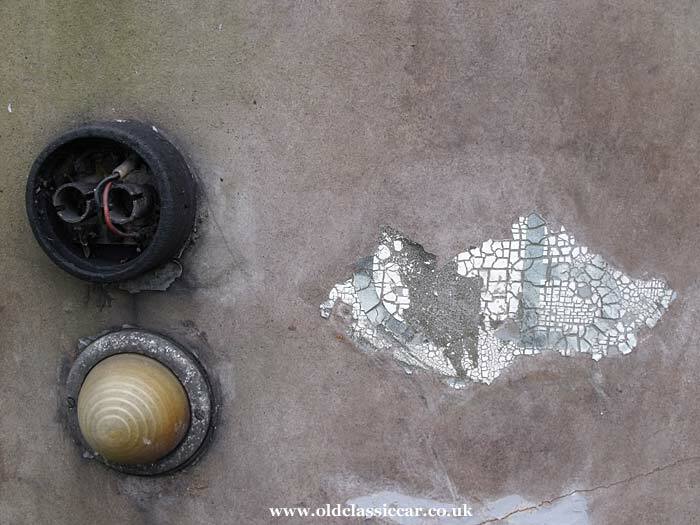 Instead, the owner simply removed the rear lenses from his or her car's rear lamps, and plugged connectors leading from the caravan's wiring loom into the bulb sockets. This obviously disabled the car's rear lighting, but enabled motorists stuck behind the caravan on winding country roads to receive notice of the caravanner's intention to stop, or turn off the highway. A very simple arrangement. 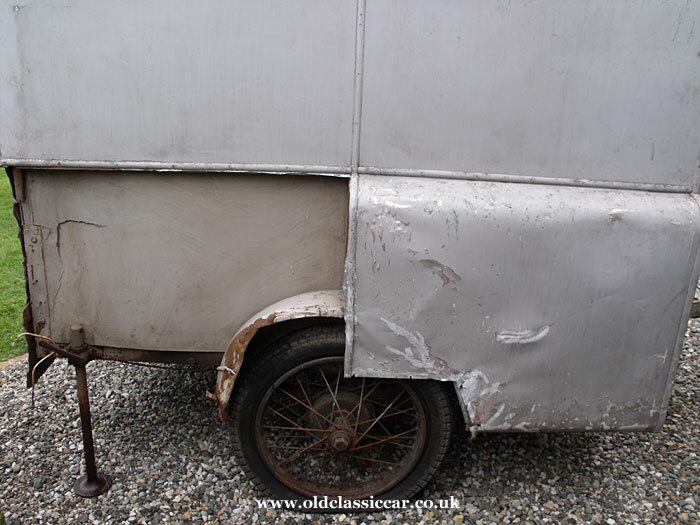 The rear panel also bears the remains of a GB sign - did this lightweight caravan tour Europe, once upon a time? There may have been a seat, or a very short bed, fitted at some point in time inside the 'van, although little else survives. Judging by the state of the paintwork, it would appear that renovation was started at some time, then stalled for whatever reason. It may be that the interior items were removed during the refurbishment work, and were subsequently lost sadly. One likely reason for the renovation is the damage that has been sustained on the offside rear corner. A quarter of the tinwork is missing, presumed torn off during an impact of some kind. This then will need replacing, along with part of the fibreboard rear panel that also suffered in the bump. The mangled mudguard, usually hidden beneath the exterior panelling, should be either repairable, or at least straightforward to replace. I believe the caravan has been out of use and stored away for many a year. So while the damage is unfortunate, to say the least, at least the caravan has survived. The question remains though - who actually put it together? It may be home-built. Magazines such as Practical Mechanics and Hobbies Illustrated ran all manner of articles aimed at handy home DIY-ers. Designs for home-built caravans were amongst them. Could this be a home-built example? Maybe, maybe not. I thought at first that being a one-off, built in a domestic shed somewhere, was the most likely option. However today I noticed that at one point, there was a rectangular plate fitted to the A frame at the front. Sadly it's disappeared but the mounting holes remain. I'm sure that, had it been present, it would have shed a great deal of light on the mystery. It may have been a manufacturer's data plate. Equally it may just have been a plate fitted to an "off the shelf" frame, on which an enterprising builder created his dream. My hope now is that by publishing these photographs, someone somewhere will be able to positively identify it for me - Please....!